The accomplishments and achievements of the Scottish Enlightenment never fail to impress. Even when considered only in its most narrow, academic sense, the influence of this relatively small group of writers and thinkers is incredible; quite literally, the disciplines we now call anthropology, chemistry, economics, geology, history, linguistics, philosophy, mathematics, and sociology would not be what they are today without the contributions of the Scottish professors and professional writers who either founded them outright or radically modernized their methods and subjects. But as the contributors to The Scottish Enlightenment and Literary Culture repeatedly demonstrate, eighteenth-century Scotland also witnessed real accomplishments on the imaginative end of the writerly spectrum: poetry, novels, dramas, and periodical writing. If we tend to overlook this side of the Scottish Enlightenment, this is partially due to the period’s overabundant intellectual glories, but also – as the editors show in their introduction – to later writers like Thomas Carlyle, who repeatedly downplayed the previous era’s literary achievements. Yet as the editors point out, ‘when we use the term “literature” to designate a specifically creative or imaginative form […] in customary distinction to other technical and institutional forms of discourse […] we are dealing with a domain not demarcated until the nineteenth century’ (3). Moreover, despite its reputation ‘as fundamentally a culture of polite consumption’ (2) when it came to the matters we’ve learned to call ‘literary’, the Scottish Enlightenment was a genuinely productive era. Following the editors’ helpful introduction, David Allan leads off with an essay describing the evolving relationship between fact and fiction in Scottish historiography in the long eighteenth century. As evidentiary standards tightened, early eighteenth-century Scottish historians like Thomas Innes (based at the Scots College in Paris) became increasingly skeptical of the accepted myth of Scotland’s founding in 330 BC by Fergus MacFerchar – a myth given a sheen of historical respectability by sixteenth-century scholars like Hector Boece and George Buchanan. The slightly later invention of ‘conjectural history’, however, reintroduced an element of creative interpolation into the practice of history writing, allowing David Hume, Adam Ferguson, and William Robertson to compose influential histories which filled gaps in the written records with educated guesses based on current theories of social evolution and human nature. The path was then set, Allan contends, for Sir Walter Scott to perfect the historical novel, with its potent mix of fact and fiction, history and imaginative license. In a similar manner, Pam Perkins’ essay also investigates changing attitudes about the proper mix of fact and fiction; her focus, however, is on the practice of travel writing during the period. Given that the line between what Perkins calls ‘literary’ and ‘scientific’ travel writing was continually being blurred, the trustworthiness of the author became the determining factor of her or his reception. In this vein, in her chapter’s second half Perkins focuses on two Scottish authors, James Bruce and John Moore, whose respective success and failure as travel writers seemed to hinge more on their contrasting reputations than on the accuracy of their accounts. Catherine Jones also takes up the travel-writing genre in her chapter, albeit with a specific focus on the work of Tobias Smollett, and within that on the role of botanical ‘materia medica’ in his oeuvre. Smollett is best known as a novelist in the comic and picaresque traditions, of course, but his training as a doctor, combined with his naval service abroad, imbued him with lifelong interests in both foreign cultures and medical practices. Making these connections between early eighteenth-century botanical treatises and Smollett’s The Adventures of Roderick Random (1748), and then tracing their influence into John Gabriel Stedman’s account of his experiences in the Dutch colony of Surinam, Jones paints a fascinating picture of the local, national, and global networks being formed in the eighteenth century. The illustrations throughout this chapter are especially pleasing. Alongside demonstrating that the Scottish Enlightenment was full of a vibrant book culture that created as well as consumed literature, one of this collection’s other consistent goals is to make clear just how much interpenetration there was between elite and popular culture in eighteenth-century Scotland. To this end, Ruth Perry’s essay, ‘Balladry and the Scottish Enlightenment’, effectively establishes that ballads were not merely part of Scotland’s folk culture; rather, they also played important roles up and down the cultural hierarchy, from being the objects of scholarly study, to the subjects of antiquarian research (and profit), to the equivalent of today’s ubiquitous ‘hit singles’. Ballads were also sources of national pride at a time when, following the 1707 Act of Union with England, the Scots were in particular need of cultural totems with which to identify and around which to rally. That’s mumbled o’er by Popish Priest. Presbyterian satirists, in turn, tended to take aim at their own, more moderate brethren; in this vein, John Witherspoon and Archibald Bruce, both traditionalist clergymen, made productive side-careers as poets mocking their fellow kirk-goers for being ‘graceless libertines and abandoned free-thinkers’ (109). Whoever said the Scottish Enlightenment was humorless? The next chapters, which focus on the roles played by drama and rhetoric in the era, are by two of the volume’s editors. (The third, Kenneth Simpson, died before the collection saw publication; many will already know Simpson’s work from his touchstone 1989 study, The Protean Scot: The Crisis of Identity in Eighteenth-Century Scottish Culture.) First, Ronnie Young digs deeply into the philosophical contexts that inform the best-known play produced during the Scottish Enlightenment, John Home’s Douglas (1756). Whereas Home’s drama is frequently analyzed as a lone theatrical accomplishment, Young demonstrates not only that it is deeply informed by Enlightened theories of human nature and sympathetic communication, but also that it enjoyed widespread support among the Scottish literati, who both defended it from charges of indecency and more generally supported Edinburgh as a theatrical destination. In the last sections of his chapter, Young turns to two of Home’s Scottish successors, Archibald MacLaren and Joanna Baillie, to trace their ongoing efforts to use the stage to explore questions of human nature and psychology. Second, Ralph McLean focuses closely on Hugh Blair, whose Lectures on Rhetoric and Belles Letters (1783) remains the pre-eminent text of its kind in the period. Rather than belabor this point, however, McLean focuses on Blair’s much-maligned relationships with Burns and James Macpherson. Whereas history has often been unkind to Blair in both cases, McLean argues that the University of Edinburgh professor was more supportive and less censorious of Burns than has often been thought, as well as less naïve and more strategic than is usually assumed in his (ultimately futile) defense of the authenticity of Macpherson’s Ossianic poetry. The second half of The Scottish Enlightenment and Literary Culture is filled with equally illuminating, absorbing pieces; matters of space, however, dictate that I only touch briefly on them here. In general, they focus on subjects that occupy the edges of the Scottish Enlightenment, both chronologically and geographically. In a chapter that complements McLean’s, Charles Bradford Bow considers Dugald Stewart’s extensive influence on Edinburgh’s literary culture in the second half of the eighteenth century; following this, Corey E. Andrews looks closely into the critical roles played by periodicals like The Mirror and The Lounger, which both grew out of Edinburgh’s Mirror Club and were overseen by another major literary figure of the era, Henry Mackenzie. Sandro Jung, continuing his long-running exploration of James Thomson’s The Seasons, enters the archives again to recover the ways that the Perth-based publisher, Robert Morison and Son, capitalized on Thomson’s success. Emulating the print appearance of The Seasons, including the wood-cut illustrations that frequently accompanied it, the Morison family began reprinting large numbers of Scottish poems in an attempt, as Jung puts it, to establish ‘a collection of nationally significant works’ (191) that would last well into the nineteenth century. The final three essays in this collection not only focus on subjects that move chronologically into the Romantic era, but also build bridges outward from the literary culture of the Scottish Enlightenment to the wider world. Deidre Dawson, in a chapter bearing the wonderful title ‘Fingal Meets Vercingetorix’, thus looks at the influence of Macpherson’s Ossian poems in early nineteenth-century France; the archival illustrations she provides – which include numerous French sketches and drawings of Ossian-inspired characters — are truly captivating, even in black and white. 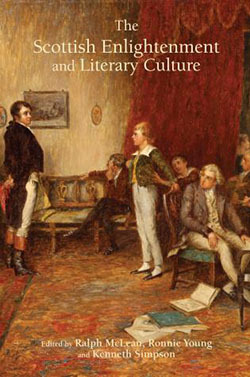 Andrew Hook contributes an essay on the transatlantic subject matter that has long engaged his scholarly experience, ranging widely over Scottish influences on American literature while paying special attention to the Enlightened influence on what is widely considered the first American novel, William Hill Brown’s The Power of Sympathy (1789). Scott’s influence on James Fenimore Cooper, while better known, does not go unremarked by Hook, and is linked to a much wider albeit somewhat paradoxical vogue for using Scott’s example to produce distinctively American literature. Finally, Sarah Winter turns to the influence of Scottish Enlightenment legal theory on early nineteenth century novels, moving from Lord Kames’ theory of equity as a ‘mutual duty’ (250) to consider how this concept is worked out in novels by Austen, Scott, and Dickens. The Scottish Enlightenment and Literary Culture is not without small flaws. Some contributors make more of an effort than others to cite relevant contemporary scholarship, leaving some essays feeling less than fully up-to-date, and there is a major typographical error in Kidd’s essay in which the author’s own writing gets confusingly mixed into a long block quotation (108). These caveats aside, the collection is carefully edited, and the essays are uniformly well-written and accessible to general readers as well as useful to scholars. The Scottish Enlightenment and Literary Culture makes for illuminating reading, whether one chooses to read it straight through or browse individual chapters for their fascinating details. Either way, this collection should finally put to rest the old canard that the Scottish Enlightenment lacked a literary culture. Indeed, the authors collectively put the literary back where it always was: right in the dynamic middle of the Scottish Enlightenment. The Scottish Enlightenment and Literary Culture, edited by Ralph McLean, Ronnie Young, and Kenneth Simpson, is published by Bucknell University Press, 2017.